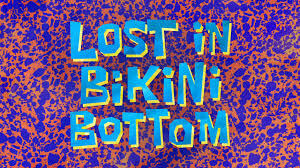 Lost in Bikini Bottom (Episode) – From SpongePedia, the biggest SpongeBob-wiki in the world! Lost in Bikini Bottom is an episode from Season 9. On a normal day in Bikini Bottom, SpongeBob and Squidward are walking to work. SpongeBob feels it was taking a bit long and thinks he should take a shortcut. Squidward tries to explain why SpongeBob shouldn't but SpongeBob still thinks he should take a shortcut. SpongeBob asks Squidward if he wants to join but Squidward declines so SpongeBob takes a different path thinking he can find a shorter way to get there but bumps into Squidward walking in the normal path. 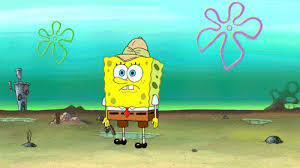 He then tries to do another shortcut then he finds himself in an unusual part of the town and tries to think it is a great shortcut and tells himself not to forget his wilderness training and tries to remember what Sandy said and then proceeds to find the Krusty Krab and tries to do what he learned from wilderness training and starts with local landmarks and assigns a broken fire hydrant as his landmark. He then spots a sign that appears to be the Krusty Krab sign and climbs over a fence and runs to it. Then the scene cuts to the Krusty Krab with Squidward relaxing in his workstation and then Mr. Krabs appears telling Squidward to stop lazing around even though there were no customers. The scene cuts back to SpongeBob going toward what he thinks is The Krusty Krab but it turns out just to be a sign that says The Krabby Krust. He notices a fish painting signs and asks him if he knew where the Krusty Krab was, but the fish, Sal, says he's never heard of it. SpongeBob told him about it, gives him coupons and then Sal goes there on his truck even though he said he didn't know that place. SpongeBob cries and remembers to use his landmarks and then tries to go back where he came from but can't remember too well. He finds the broken fire hydrant he found previously but then notices many broken fire hydrants. SpongeBob finds a Pay Phone and calls Squidward and asks what he should do. The operator interrupts the call and tells him if he wants to continue the call he needs to insert another dime but he doesn't have one. He spots an abandoned sofa and then sees three tough-looking fish drinking soda and SpongeBob tries to reach under the the cushions of the sofa to see if there are any dimes but instead finds two nickels and then one of the fish, Scott, asks him what he was doing and SpongeBob tells him that he is looking for a dime. Scott shouts at SpongeBob and says that he drives a pedicab so SpongeBob hops into the pedicab and tells him that he needs to go to the Krusty Krab so Scott drops off to what he thinks is The Krusty Krab but it turns out to be at The Krusty Klam. SpongeBob began frantically running and checks his clock and then starts to make another shortcut which causes him great pain but finally finds the Krusty Krab. He crawls to it and enters, and then hugs two customers, and kisses one of the elderly customers. He finds Patrick there and SpongeBob asks Patrick how he got to The Krusty Krab and Patrick says that Scott gave him a ride. Mr. Krabs appears and says that SpongeBob is scaring his customers away and then tells SpongeBob to go home and take a bath. Squidward says that it was his thing. Mr. Krabs says that he is clean and then Squidward starts to roll around inn the dirt and asks where his bubble bath was. Then Sal comes to The Krusty Krab on his truck and runs over a puddle which splashes on Squidward. Sal asks about the coupon but Mr. Krabs says it's actually another fee. Mr. Krabs and Sal walk off screen. Squidward still left in the puddle and then the episode ends. The original title for this episode was "The Shortcut." The French dub of this episode ("Le Raccourci") still uses this title. There have been promotions for this episode called "Where's the Square?" This episode premiered right before the 2015 Kids' Choice Sports Awards. This is the first episode to be produced after the Second SpongeBob movie finished production. This is the first episode to be written by Jack Pendarvis. Starting with this episode, SpongeBob is now script driven rather than storyboard driven. This episode takes place before "Party Pooper Pants" because in this episode SpongeBob does not know what a pay phone is, but in "Party Pooper Pants" he uses one. Lowercase closed-captioning, not seen since "That's No Lady" aired in 2006, returns starting with this episode. In the beginning, there's a gag where SpongeBob wakes up and shouts random gibberish while falling down the stairs getting ready for work, a possible continuity reference to "Missing Identity." There were two similar Krusty Krab like places: The Krabby Krust and The Krusty Klam. This episode almost takes place in real time. SpongeBob's shortcut takes him 12 minutes, and he's shown taking the shortcut for 8 minutes. Squidward breaks the fourth wall when he is drawing his "distance between two points" example on the screen. Patrick is shown to sometimes take Scott's pedicab to the Krusty Krab. The fire hydrants in this episode were shown to be all metal. The ones in "Squidville" and "Prehibernation Week" are part metal, and part barrel. This episode's title card uses the same pattern as Squidward's bathroom wallpaper, though not the same colors. This page was last modified on 9 March 2019, at 09:52.